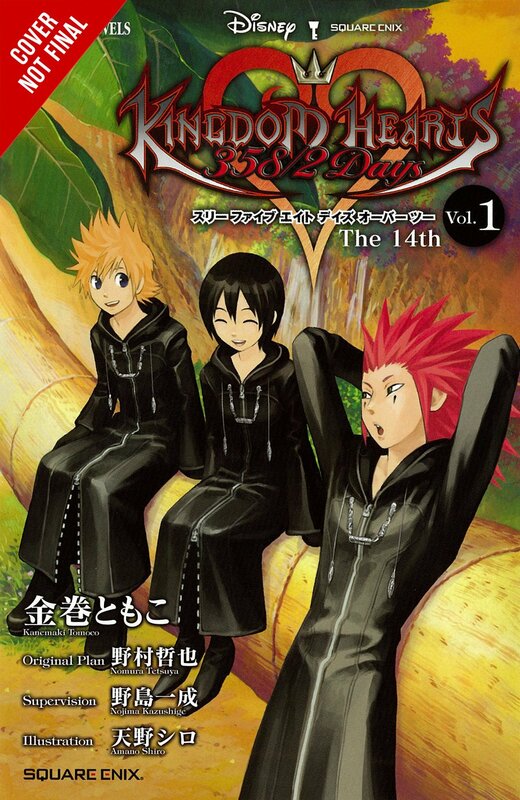 If you enjoy a bit of light reading before bed then surely you should have read all of the official novel translations of the Kingdom Hearts series that YenPress have released thusfar. The good news is will be able to add a new addition to your novel collection soon, as the Kingdom Hearts 358/2 Days novel will release on June 19th 2018! It's only been 7 days since Roxas has been put in charge by the Organization to look after a new Nobody who was just born. Though their face and body are hidden by a hood, Roxas spends several significant days with this mysterious stranger. The novel was first revealed in December 2016 alongside Kingdom Hearts II: The Novel Volume 1 & 2 and Kingdom Hearts Birth by Sleep: The Novel Volume 1. Kingdom Hearts 358/2 Days: The Novel compiles all three of the novels into one handy omnibus, however the cover isn't finalised yet and a placeholder was provided by YenPress in December 2016, which you can view above. YenPress released Kingdom Hearts II: The Novel Volume 1 in June 2017, and Volume 2 is expected to release just in time for Christmas on December 19th 2017. No release date has been provided for Kingdom Hearts Birth by Sleep: The Novel Volume 1. YenPress previously published Kingdom Hearts: The Novel and Kingdom Hearts Chain of Memories: The Novel. Yayyy. Of all the games, Days seems like it would make for the smoothest novelization, so I'm really looking forward to revisiting it. I can beat that: I just finished Chain of Memories and I was completely caught off guard by how much the Reverse/Rebirth portion focuses on Riku Replica. It was like Chain of Memories: Final Mix practically! So much hope for BBS. So much. Might get this one, too, although I still have my hopes up for german translations one day (which is stupid cause SE didn't care much about us during the orchestra WORLD tour). Yesss, I read that one when it came out and it blew me away just how much insight it gave on him. I wasnâ€™t expecting it and his whole story arc is so trippy and exactly what I always kind of wished CoM had been. Yep. Just, bless Tomoco Kanemaki's gift for developing characters. It's like she knows just how to pull what she needs from them and weave it into the larger narrative. I feel like Days will really benefit from both the novel format and her singular voice in authoring it. Just wondering, is there any possibility for Dream Drop Distance to have a manga adaptation in the future? I'm aware that Birth by Sleep had one. There's no BBS manga adaptation. Muke's right, there's no bbs manga. Amano stopped the Manga series with KH2. Now, if we were taking about the novels, there are indeed novels. Yen Press has confirmed they will be releasing BBS once they finish Days and the Short Stories. After that itâ€™ll likely be Re:coded and KH3D since those are the last two games that got novelizations. I'm definitely much more excited that the BBS novelization is finally going to make it stateside, but i'm looking forward to Days novel as well! On another note, does Nomura consider extra stuff in the novelizations canon? I have seen a few people give different answers for this so I was just wondering. I don't know how I missed this. I'm so excited!! And I didn't realize BBS was for sure coming after, too. I really can't wait for that one omg. I'm gonna love all of these. Will this novel finally show us who Roxas will have ice cream with? Can you believe that I have not read any kingdom hearts literature yet (besides fan-fiction)? Lol, I need to get in on that. It is time, Jacqueline. You wonâ€™t be disappointed.